Today, Mayor Ed Murray joined mayors of Boston, New York and San Francisco in sending a letter to Federal Communications Commission (FCC) Chairman Ajit Pai, encouraging him to keep the internet open. The letter articulates net neutrality rules and recognizes the importance of maintaining a level playing field for all internet content to be enjoyed by all users, regardless of their internet provider. This letter is part of the Day of Action to Save Net Neutrality. In February 2015, the FCC ruled in favor of net neutrality by reclassifying broadband as a common carrier under Title II of the Communications Act of 1934. Those rules went into effect in June of 2015. Now, the FCC is taking comment from the public until August 16, 2017 on a possible repeal of net neutrality. The FCC has already received nearly 5 million comments from the public. The City of Seattle encourages residents to comment, call or email the FCC and tell them to keep net neutrality. To learn more about the City of Seattle’s Day of Action to Save Net Neutrality, visit www.seattle.gov/netneutrality. Today, Mayor Ed Murray celebrates the start day of the Summer 2017 Internship season by thanking new corporate partners and City departments that are supporting the Mayor’s Youth Employment Initiative (MYEI). Support for the initiative ranges from hosting interns to contributing funds to support wages for youth placed at other organizations. To date, more than $500,000 has been raised to support interns’ wages, transportation, and other support, in addition to employers who host and pay the interns directly. This year’s partners include: Anchor QEA, Artefact Group, AT&T, C+C, Comcast, Downtown Seattle Association, Evergreens, Bill & Melinda Gates Foundation, Google, JPMorgan Chase, Kaiser Permanente, King County International Airport/Boeing Field, Launch, Novo Nordisk, Pacifica Law Group, Point B Inc., Port of Seattle, Swedish, Tom Douglas Restaurants, Uber and Waldron. 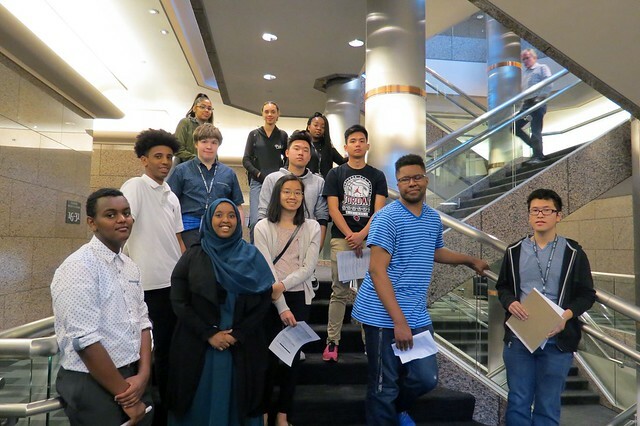 Building on decades of success of the Seattle Youth Employment Program (SYEP), in 2015 Mayor Murray launched the MYEI, which connects Seattle youth ages 14-24 with paid internships and employment opportunities. Seattle youth ages 16-19 have an unemployment rate around 21 percent, while unemployment for youth ages 20-24 hovers around 10 percent, far above the overall city rate of 2.9 percent. As a result, Seattle youth are missing out on vital work experience and income, which hurts lifetime earnings. The need for summer employment opportunities continues to grow. In 2015, the initiative connected more than 2,000 youth with life-changing internship opportunities. The City enlisted Educurious in 2016 to include the private sector in the solution and saw a 74 percent increase in the number of positions filled, totaling 3,484. This year, as the initiative continues to grow, we are strengthening our partnerships with the community, including Seattle Public Schools, Juma Ventures, YouthCare, and YouthForce. Earlier this year, Mayor Murray announced a new directive extending participation in MYEI to all City departments. Today, Mayor Ed Murray marked the 3-year anniversary of Seattle’s historic $15 per hour minimum wage ordinance by visiting local small businesses across the city. Since the passage of the minimum wage ordinance, Seattle’s economy continues to grow with job creation on the rise and workers taking home more income. The minimum wage hit $15 for the first time in 2017 for employees of Seattle’s largest businesses. Raising the minimum wage to $15 per hour was one step in a multi-pronged approach to close the affordability gap for low-wage workers. Mayor Murray has addressed housing affordability through the Housing Affordability and Livability Agenda and created the Seattle Preschool Program to provide high-quality, free education to Seattle families as part of his vision for a more equitable city. Mayor Murray also successfully passed a transportation levy that increased bus service to historic levels, helping workers connect to job centers throughout Seattle. Seattle’s unemployment rate dropped to 2.6 percent over the last two years. Median household income increased during the same period to $80,349. Restaurants were among the fastest growing industries, employing over 33,000 people in 2016 alone. Additionally, a study released today by the Center on Wage and Employment Dynamics at University of California Berkeley’s Institute for Research on Labor and Employment found that Seattle’s minimum wage ordinance has raised wages for low-paid workers, without any negative impact on employment. Mayor Murray visited Broadcast Coffee Roasters, Central Co-Op, and Molly Moon’s Homemade Ice Cream to celebrate the $15 minimum wage and to hear from owners and workers on the economic benefits of the ordinance. Additionally, Mayor Murray and the Office of Economic Development are examining policies to address commercial affordability, especially for small businesses. The same market pressures driving up housing costs are putting pressure on small and minority owned businesses. Last year a Commercial Affordability Advisory Committee offered several suggestions to help small businesses thrive in Seattle, even as wages increase. Today was supposed to be a day of celebration for Seattle’s African American community. On Juneteenth, we were scheduled to be here in the heart of Seattle’s historic Black neighborhood breaking ground on the future Liberty Bank Building, an inspiring community driven project that includes $12.2 million in City dollars to turn Seattle’s economic success into a model for inclusion rather than gentrification. And while all of that is true, we are here today, grieving. Again. Grieving over yet another devastating encounter between an African American family and the police. Grieving over yet another death in the African American community. Seattle’s Black community is hurting. Seattle’s Black community is angry. This is a painful part of our city’s history — the hurt and the anger that the Black community has endured for decades. For too long. But your deep sense of injustice and your deep dissatisfaction have led to action. Your activism and collaboration with the City led to the landmark and historic police accountability legislation I signed last month. That legislation gives civilians an unprecedented, independent oversight role of investigations into police conduct. Of course, that does not bring Charleena Lyles back. Like all of us, her family is now plagued with questions about this shooting, from technical policing questions to philosophical and moral questions. Sadly, African American families may now be questioning whether they should even call the police during emergencies. An unacceptable, but real dilemma that undermines just governance. And points to the ultimate question that continues to define all these tragedies: This city is asking itself what factor race played in the death of Charleena Lyles. That is not meant as a judgment, but as the reality of the type of questions we must be asking. Under this new era of accountability, yesterday’s police shooting will be thoroughly investigated. The pressing questions about how and why this happened will be answered. Must be answered. Must be answered for her family and her children. Must be answered for all who are grappling with this tragedy, particularly for the African American community. You are grieving today, and I am committed to an exhaustive investigation of this shooting. We are committed to the well-being, the civil rights, and the success of Seattle’s African American community. That’s why we are here today at the site of the Liberty Bank Building, the future home of a development that will include more than 100 units of affordable housing. I want to congratulate all the partners who made this project happen. Today, we are not simply breaking ground on another Seattle construction project. We are breaking ground on a project that “gets it.” We are breaking ground on Seattle’s steadfast commitment to equity. The First Bank Building is named after the first Black-owned bank West of the Mississippi, which opened its doors on this spot in the heart of the Black community in 1968. We will build 115 units of affordable housing here. While the city’s economy is booming, I have simultaneously been concerned that too many are being priced out of the city they love. Nowhere is this more acute than in the Central Area. But an uncompromising tenet of this city is that growth must be accompanied by inclusion. That’s a lofty goal. Fortunately, our Housing Affordability and Livability Agenda puts teeth into it: We are now mandating that developers contribute to affordable housing every time they build. This unprecedented policy couples economic growth with housing affordability. In the case of Liberty Bank, funded in part by City housing levy dollars from the Office of Housing, this fight for inclusion explicitly and proudly recognizes the Central Area’s unique history. And that means recognizing its legacy businesses, religious institutions, organizations, and longtime residents. The agreement for this new development makes a high-priority commitment to secure long-term African American ownership for the building, and that the bottom floor commercial space will support and develop African-American businesses. But policy alone cannot guarantee success stories like today’s. Guaranteeing and achieving inclusion also takes perseverance and partnerships. In fact, there’s no way to be inclusive without forming partnerships. I applaud Centerstone, Black Community Impact Alliance, Africatown, and Capitol Hill Housing for your perseverance on behalf of this community, and for establishing a partnership that not only prioritized affordability, but also prioritized this City’s values. Your partnership demonstrated that a community can shape the way it grows and changes — can shape how Seattle grows and changes. I’d also like to also thank my Office of Economic Development for their role to support the growth and development of black-owned businesses in the Central Area, and for identifying black-owned contracting firms. This historic partnership may be a first, but it cannot be the last. And it will not be the last. Mark my words, you have established a new standard. Call it the equity standard. I now turn it over to Chris Persons, Executive Director of Capitol Hill Housing, to continue to mark this very special day.